At the cutting edge of crime fiction, Mystery Weekly Magazine presents original short stories by the world’s best-known and emerging mystery writers. The stories we feature in our monthly issues span every imaginable subgenre, including cosy, police procedural, noir, whodunit, supernatural, hardboiled, humour, and historical mysteries. Evocative writing and a compelling story are the only certainty. 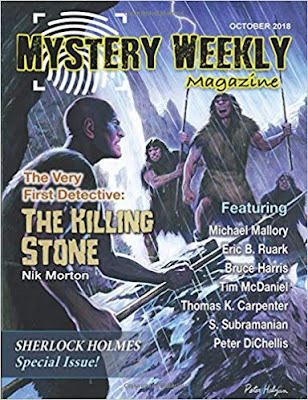 In this issue: In our cover feature, “The Very First Detective: The Killing Stone” by Nik Morton, a series of controversial prehistoric paintings on stone tablets recently discovered in a secret cave complex in the Pyrenees reveals the workings of the very first detective. In “The Inimitable Affair” by Michael Mallory, Sherlock Holmes works to prevent a scandal that could rock the very foundation of Victorian England by destroying the reputation of one of the era's most respected and beloved figures, who cannot defend himself. “The Beekeeper’s Dilemma” by Eric B. Ruark: faced with minding his own business or not, the old beekeeper proves that old habits die hard. “A (Deliberately) Tangled Skein” by Bruce Harris, a non-fiction piece, explores the first Sherlock Holmes story “A Study in Scarlet,” whereby Dr. Watson intentionally deceives the reader by altering the narratives of two key characters. “The Secrets Of Skin” by Thomas K. Carpenter—the saga continues—in ancient Alexandria, Magistrate Ovid must solve an unusual crime. “A Death In Tadcaster” by Tim McDaniel: what if a Miss Marple-type of detective is not as sweet and innocent as she seems? The Beginning Of The Final Problem” by S. Subramanian, presents a locked-room mystery, with a brief pre-history of Holmes's arch-enemy, in which a young Bertrand Russell (imported from Cambridge to London for the purposes of the story) is featured in a cameo role. 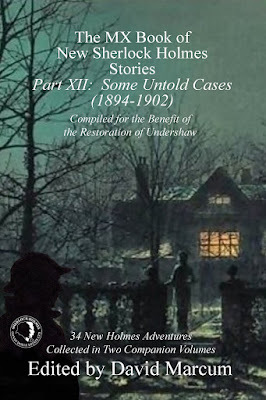 The Kickstarter for the next volumes, Parts XI and XII, Some Untold Cases. Please share far and wide with your friends, fans, and family. The campaign will run for only 18 days from today... Participants will get these volumes at a significant pre-publication discount. Please check out the link above. "The MX New Book of Sherlock Holmes Stories” collection has over 100 of the world's leading Sherlock Holmes authors participating. 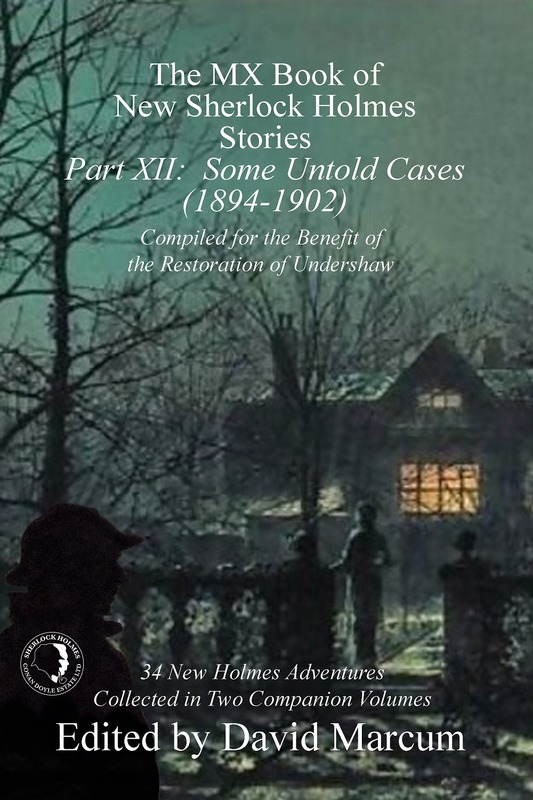 The anthology includes only traditional stories set in the original Sherlock Holmes period. Between them, these authors have sold millions of books, and they come together for a common cause - Undershaw. Part XII: 1894-1902 C.H. Dye, David Marcum, Thomas Fortenberry, Daniel D. Victor, Nik Morton, Craig Janacek, S. Subramanian, Jim French, Robert Stapleton, Nick Cardillo, Paul D. Gilbert, Mike Hogan, Derrick Belanger, John Linwood Grant, Mark Mower, Jane Rubino, and Arthur Hall.